Quiet month around here at BeerScribe.com. I’ve spent most of my time editing the galleys of my book, which will be published in August (2010), and doing assorted legal work. I’ve also been preparing (in a very general sense) for an upcoming 10-day trip to England (London, Oxford, and Dover for the 17th White Cliffs Festival of Winter Ales — mainly strong beer, i.e. nothing under 5%. Gotta love the British). So after sending off the final edits today, I ran some errands and decided to stop by my local package store, Downtown Wine and Spirits in Davis Square. Visiting Downtown is a little like heading to Saks or Armani to check out the suits. Everything looks great but, generally speaking, you wouldn’t dare think of buying anything. There are two reasons for this line of thinking. First of all, the pricing is generally considered to be 5-10 percent above other local stores. Second, Downtown is where good beer is sent to die a slow, warm death. With very little cold box space, I’d venture to say that 70 percent of the brands available in the store just sit on the floor or hot store shelves under tough fluorescent lighting. Now don’t get me wrong, Downtown has a fantastic selection in theory. And I even occasionally buy age-worthy Belgians from the store’s shelves. And when it comes to fulfilling beer geek wet dreams, Downtown is your spot for eye candy. But like Monet or Amsterdam Red Light District window dressing, the proof is in the close-up. Most bottles are covered in a coarse layer of dust with no idea given as to how long they’ve been hanging around. Stock rotation is not in the vocabulary here. And it’s not as if there isn’t plenty of space available to put in additional cold boxes. To the contrary, space is plentiful, with rack upon rack, shelve upon shelve screaming out for some chill. So I mainly direct my attention to the cold boxes on my semi-annual visit. After remarking upon how a South Carolina brewery is now selling beer in Massachusetts (a definite sign of either how far craft has come or the beer apocalypse) and noting all the great but dead beers on display, today’s visit culminated in the purchase of some safety choices. First, the American Stout, Babayaga, from our friends Dann and Martha at Pretty Things Beer & Ale Project. That’ll be saved for another day, as will my second four pack of Brooklyn’s perennial aging favorite, the Black Chocolate Stout. 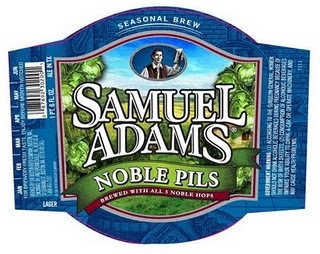 That leaves us with the final offering, a six pack of Boston Beer’s Samuel Adams Noble Pils. I’ve noted a lot of press about this new release and even believe I’ve sampled it on at least one occasion previously, but have no memory of it. As you may know, I tend to be a touch partial to pilsener beer. And since I do not have ready access, despite my suppliers, to Sly Fox’s excellent Pikeland Pils and Victory’s Prima Pils seems to have disappeared from most local tap handles, I was excited about the prospect of having a zesty, zippy German style pils to buy when. say, I’m in Tampa or other less beer-centric places. So in recognition of finishing my edits and reviews on the book, I offer a rare BeerScribe tasting note for the Noble Pils.